Be the first to share your favorite memory, photo or story of Lawna. This memorial page is dedicated for family, friends and future generations to celebrate the life of their loved one. 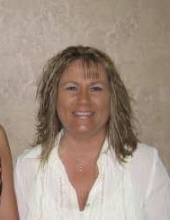 Lawna R. Erickson, 56, of Kendallville, In formerly of Eldorado, passed away, Friday, March 15, 2019 in Indiana. She was born on July 3, 1962 in McLeansboro to Jim and Joan (Yates) York. She was a graduate of Eldorado High School class of 1980, she worked as a teachers aid and she attended the Eldorado First United Methodist Church. Surviving is her husband, Brian Erickson of Kendallville, IN. Also surviving are her children, a son Josh Winters of Eldorado and a daughter Kalie (Gabe) Cooley of Eldorado, two grandchildren, Reed and Luke Cooley, a sister Beth (Mike) Ande of Eldorado, her mother Joan York of Eldorado and a special dog, Addie. She is also survived by several aunts and uncles and cousins. She was preceded in death by her father Jim York. Funeral services will be held on Tuesday, March 19, 2019 at the Watson Funeral Home in Eldorado at 11:00 AM with Rev. Scott Johnson officiating. Burial will be in Lindale Cemetery. Visitation will be held on Monday, March 18, 2019 at the funeral home from 5:00 PM until 7:00 PM. Memorials in her memory may be made to Hospice of Southern Illinois and envelopes will be available at the funeral home. To send flowers or a remembrance gift to the family of Lawna R. Erickson, please visit our Tribute Store. "Email Address" would like to share the life celebration of Lawna R. Erickson. Click on the "link" to go to share a favorite memory or leave a condolence message for the family.